Big can of sliced peaches. Grease a 5 cup ovenproof baking dish or 4 individual dishes. Beat eggs with electric mixer until pale and thick. Gradually add sugar and vanilla, beating til well combined. Sift flour and spice over mixture and fold through lightly using a wooden spoon. Place peaches in baking dish and spoon batter over the peaches. Bake for 30 minutes or until golden. Serve with icing sugar and thick cream or custard and thick cream. This a typical traditional Dutch cuisine and cooked in winter time. Season the meat and brown it together with the diced onion in the fry pan. Add water, vinegar, sugar and bay leaves; making sure to add enough water so that the beef is submerged. Bring to a slow boil, then turn down the heat, cover and simmer for a good two hours. Add extra water if needed, to keep beef submerged. 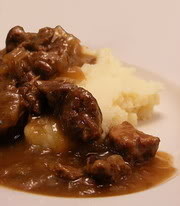 When the beef is tender to your liking, thicken the juice with corn flour and serve the hachee with mash. My mum used to make potato and carrot mash (wortelen stamp pot) and serve the hachee with that. Even though I don't need to cook for a big family anymore, there are still some recipes that I love to cook and eat.